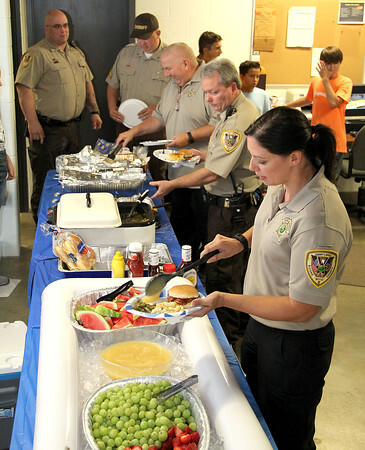 Thoughtful Gesture: Boone County Sheriff's Office workers (from bottom) Annie Greene, Joe Rady, Robert Hatfield, Joe Grzybowski, and Jermy Smith que up to go through the buffet line set up in the bottom of the Boone County Jail Thursday afternoon. Lebanon First Baptist Church and the Laughter and Love Daycare put on the affair for Boone County Sheriff employees and the Lebanon Police Department. LFBC men's fellowship member Ron Forsythe said the groups wanted "to show our love and support for our officers." Pulled pork and pork burgers were supplied by the Boone County Pork Producers, and other items included green beans, macaroni and cheese, fresh fruit and a dessert table. Sheriff's dispatcher Sara Forsythe, and daughter of Ron, said the daycare also provided handmade pictures of childeren's hands and feet with the "Blue Line" through the middle for most officers to show their appreciation.